Pears brighten the intense flavour of Christmas pudding in this recipe, which you can prepare a day in advance and either serve cold or cover with foil and warm through in the oven before serving. Preheat the oven to 160°C/gas 3. Put the pears in a pan with the sugar, 150ml water, the star anise, lemon juice and half the zest. Bring to the boil over a medium heat. Cook for 10-15 minutes, until the pears are tender and the liquid reduced by a third. Meanwhile, beat the eggs in a bowl, then add the cream and milk, and mix well. Line the bottom of a 2 litre baking dish (about 20cm x 30cm x 5cm) with a layer of bread. Break the Christmas pudding or cake into small lumps in a mixing bowl. 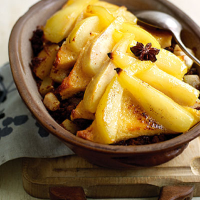 When the pears are ready, remove about half from the pan, roughly chop and mix with the pudding. Spoon a third of the syrup over the bread, sprinkle with half the remaining zest, then cover with half the pudding and pear mixture. Add another layer of bread and repeat. Place a final layer of bread on top, arrange the remaining pear slices over it and drizzle with the remaining syrup. Pour the egg, milk and cream mixture over. Bake for 40–45 minutes, then place under a hot grill for a few minutes to brown. Serve with cream, brandy butter or custard. Try a low-alcohol moscato fizz with this. This recipe was first published in December 2008.